Stylish Star Allu Arjun, Rakul Preet Singh and Catherine Tresa starrer Sarrainodu released yesterday is off to flying start. Allu Arjun with good fan base in families, kids and other sections gained broad mass adore with Sarrainodu. The film is a big hit in class centers and exceptionally blockbuster in mass zones. Allu Aravind produced Sarrainodu on Geetha Arts with a high budget on uncompromised production standards. The day Boyapati narrated Sarrainodu story; he felt this is going to make wonders at box office. Sarrainodu opening collections proved Allu Aravind right. Film was shot in exotic locales of Bolivia, a landlocked country none of the Telugu films visited so far. 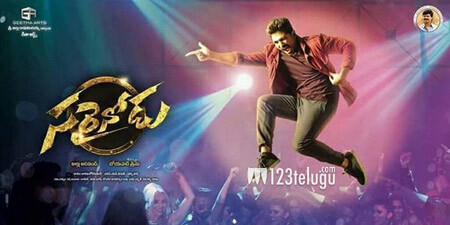 Allu Arjun’s mass look, energetic screen presence is lauded by mass audience. Fans are enjoying his mass mannerisms, styling, dances and action. Pre interval action sequence, climax episodes are thoroughly captivating with roof shaking whistles and claps. Blockbuster song is other big treat for masses and Anjali’s sizzling show is masala feast for eyes. SS Thaman re-recording, Rishi Punjabi camera work glorified the essence. Director Boyapati Sreenu is a specialist with mass pulse. Boyapati handled Bunny’s heroism elevation and action sequences quite well. After Bunny and Desamuduru, Sarrainodu opened the flood gates for Allu Arjun to become a potential mass hero. Sarrainodu is sure to dominate box office for next two weeks because of summer holidays and no further prominent releases. There’s no stopping for Bunny all along the summer.